Cookies with cute names are just more fun, don't you think? I sure do! This little cookies not only lay claim to an adorable name- they pack a lot of flavor! If you've ever had a "Nutty Irishman" coffee drink from your local coffee shop you know that it is the sweet combination of Irish Cream and Hazelnut (I'm familiar with the non-alcoholic version using flavored syrups, but apparently you can use real Irish Cream and hazelnut liqueur). Well, I've taken that idea, along with an inspiration from Hershey's Kitchens, and twisted it into a delicious cookie form! 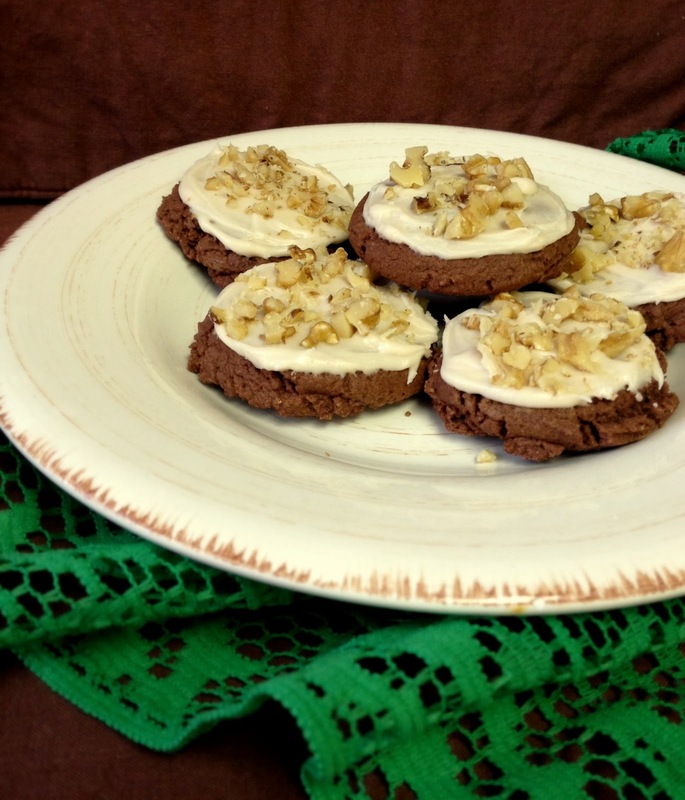 The base cookie itself is a fudgy chocolate variation on a sugar cookie infused with coffee and Irish cream and hazelnut syrups. 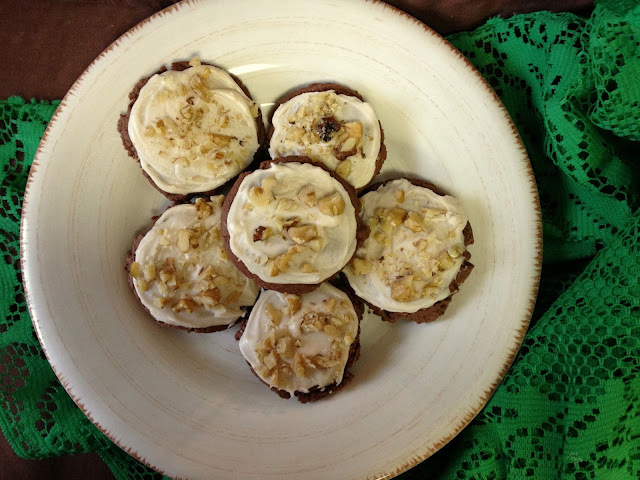 The frosting itself gets a boost from the Irish cream and then the cookies are finished off with a sprinkling of chopped nuts. The result is a decadent delight in which all the principal flavors shine through! And here's an added bonus: if you don't have any Irish cream syrup on hand (which I didn't), I found a great DIY recipe that tastes fantastic! Plus, you'll have a lot left over to add to your coffee come Sunday morning! 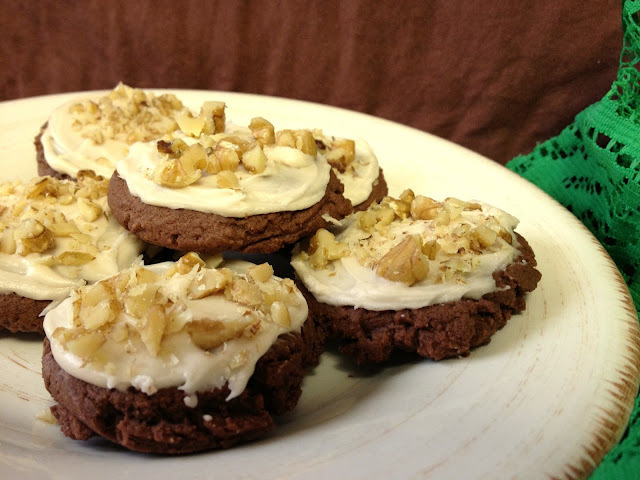 So, Irish or not, add a little nuttiness to your life with these pretty, scrumptiously festive cookies! Dissolve instant coffee in hot water; set aside. Sift flour, baking powder, salt, and cocoa powder together; set aside. In a large bowl, cream together Crisco and sugar until light and fluffy. Beat in the eggs one at a time, then stir in vanilla, coffee syrups and dissolved coffee. Gradually blend in the dry ingredients until fully absorbed. Using cookie scoop or teaspoon, form 1 in. balls of dough and place about 2 in. apart on a cookie sheet. Flatten slightly with the bottom of a glass. Bake 6 min. Cool on sheet 2 min., then remove to a wire rack to cool completely. To make frosting: Combine all frosting ingredients and beat with electric mixer until smooth and spreadable, adding more milk if necessary to reach desired consistency. When cookies are cooled (about 20 min. ), frost and sprinkle with chopped nuts. Frosting will set up, then cookies can be stacked for storing.